The fact that the actor George Clooney is widely regarded as one of the best-dressed men in the world is preposterous. There are a variety of reasons why Clooney isn’t well dressed: he invariably wears utterly boring dark ready-to-wear clothes, his suits are usually made from overly-shiny fabrics with little visual interest, he wears black shirts (always a mistake) and tends to wear charmless snow-white ones the rest of the time, he never wears a tie and compounds this by wearing shirts with collars that collapse under his jacket, his dinner jackets have satin lapels, the jackets are often ill-fitting, and he doesn’t bother to get his trousers or sleeves tailored to the correct length. Of course, despite these sartorial foibles Clooney remains hugely admired by women and men, and not just because he’s so handsome; he has much to teach us about style. He may not care for the intricacies of dress, but he does understand the importance of a man’s appearance. And as a result he’s a very relevant source of inspiration to the millions of men who want to look good, but for who clothes are never going to be a hobby. 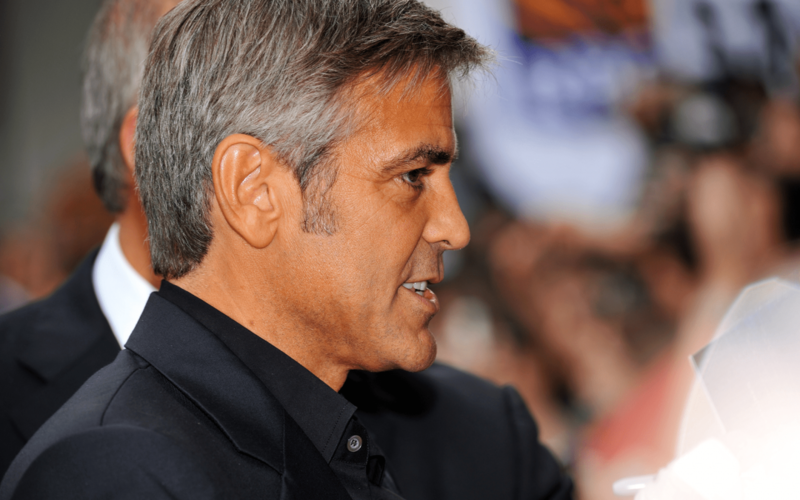 The lessons that Clooney has to teach guys are to be well groomed at all times (and please note that he’s as well groomed when he sports a full beard as he is when he’s clean shaven), treat tailored clothes as a default setting, and don’t scrimp when it comes to getting a hair cut. These things won’t make a man look like the actor, but they’ll lift him above the quotidian.